Marin will look Baja. Berkeley like Bakersfield. That’s the projection of climatologists for the end of this century, if global warming continues on its current path. But in trying to determine what California’s plant life will look like based on those projections, studies and computer models only go so far. Despite the dire warning raised by this recent plant-loss study, biologists say the reality probably will be a lot worse. In trying to get your mind around the idea that two-thirds of California’s endemic plant species will lose 80 percent of their range by the end of the century, there are two ways to look at it. The first is that, well, plants will just be different. It’s not as if we’re going to have barren soil where plants are now. As climate changes and warms, plants will most likely shift to the north. If we’re talking an 8.3 degree Celsius shift in the summers, that means a rise of about 15 degrees Fahrenheit during the summer. Desert plants would move into Bakersfield and the Central Valley, for example. And in the Bay Area, the climate would be more similar to Southern California. So, one way to think about it is: Plants will migrate or shift to cooler climates, so our endemic plants wouldn’t necessarily disappear – they would just shift north. But there were many factors that were NOT included in the plant-loss projection. And, as study author David Ackerly says, they are sobering. If plants migrate, where will they go, and how will they get there? They need a certain type of soil, a certain amount of water. Many times, they interact with and need the plants or animals around them to survive; for instance, the gooseberry might need an animal that likes its berries so that its seed can be spread. And they don’t just get up and walk north. It’s a long, laborious process that can easily be derailed. During the last Ice Age, plants migrated a thousand miles, Ackerly says, over about a thousand years. So why can’t plants here move a hundred miles in a hundred years? Let us count the ways. So IF the soils are compatible, IF the entire ecosystem of plants and animals can successfully travel north, IF such sites as vernal pools can somehow be created in the north, IF those ecosystems can somehow leapfrog over cities, farms, reservoirs, roads, ranches and other developments and find a compatible area that doesn’t already have a robust ecosystem, IF the slow-growing plants can somehow travel a mile a year for the next hundred years, then yes, you’ll successfully have a new habitat in a different place farther north. Biologists suspect that most endemic plant species in California will die, if climate change continues at the same pace. For instance, redwood trees could still be growing in California by the end of the century, because the adults are hardy – but scientists say it will be a forest of the “living dead,” meaning that, if no seedlings can make it, those adults will be the last redwoods on earth. And the plants that come in to replace California plants, they say, will be invasive species – more commonly known as weeds – the fast-growing Mediterranean-climate plants with light, airborne seeds that will take over a barren area. That’s different plant life, true. 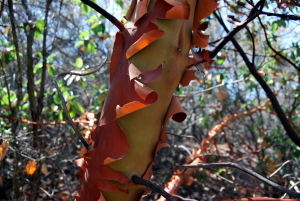 But it’s unlikely, they say, that our madrone or bay ecosystems will actually be re-created a hundred miles away, unless we move them up there ourselves. View a slideshow of the“Disappearing Plants” Radio Report online, as well as find additional links and resources. On the radio story, it said that David Ackerly and Scott Loarie just released an article about this issue? Would it be possible to post that article, or send the reference? My view, is that researchers and speculators about redwoods and climate have far too little knowledge to even make a guess. With all the water and fog that rolls in, it would be more likely to expect a slight habitat migration, than a habitat elimination. The germination stuff is too spread out over time for the average person to grasp in a lifetime. For example, we were on Mt. Hood in Oregon, counting whorls on tiny 2′ tall mountain hemlocks. We found no less than 17 whorls, showing that the last time prior to our visit that conditions were right for germination and survival, was almost 2 decades earlier. And what if it was 3 decades? Maybe that’s not a long time. How do we know that 200 year spans between optimal germination and survival conditions is not an appropriate amount of time for the redwoods. Just because we can find evidence of shorter intervals, does not mean that the short intervals are optimum on natures timetable. The findings are disturbing – however, knowing about prior disasters humans have created by mucking with natural progressions (whether we like them or not; whether we contributed to them or not)makes me feel very dubious about us moving species and hence ecosystems because we “think” we are “doing the right thing”. Think we need more information to determine if plants are really disappearing over the long haul. Guess you have to be buying in to Global Warming. Need to do my own personal research to see if this is really happening. I really liked the comparison of the north and south facing slopes- from the radio clip. That really made the concept more tangible– I will definitly use that on my nature hikes with students (high school science teacher). It’s truly amazing to think about how many connections there are in an ecosystem and how little we are able to predict about what might happen if one tiny aspect changes – a 1 degree temperature change seems so minimal, yet can have a devastating effect on many components of an ecosystem. I too was taken by the comparison between north and south facing slopes, and the significantly different outcomes based on less than one degree difference in temperature. The reporter’s revelation that the future reality is probably much worse is worrisome indeed. Makes me think we need hundreds of modern Johnny Appleseeds to become the “legs” of our indigenous plants and spread their seeds far and wide. Talk about the “living dead,” what fate awaits those bristlecone pines in tens of thousands of years? I have often thought of moving to San Diego for the better climate and flowering plants. Now you tell me San Diego is coming to me! Seriously, the whole concept is mind boggling. Did the same kind of changes take place before humans took over and started changing the climates? What effects did the shifting continents have compared to changes in temperature? Can super computers actually model all these changes? So many questions…. Obviously this is something that we need to be concerned with as it is another indication of the dramatic impact that humans have on the environment. Is this something we can stop? I doubt it. Too many Americans are more concerned with their wallets and convenience than with the environment; too many of our population do not recognize the effects of the choices we make. On the positive side, nature is an amazing thing and computer models are only guesses based on variables set by scientists. Some of the assumptions made in this study could be flawed and thus the outcome may be different than predicted. Nature is going to do what nature is going to do to survive. Sometimes to our our total amazement things that appear to be so bleak are not quite as bleak as we make it out to be. When Yellowstone experienced those devastating fires 20 years ago, people thought the park would not recover. It did recover although not in the same way many may have wanted. Sometimes it’s best to see how nature is handling a situation and let her lead the way in dealing with the changes natural or man-made going on around her.